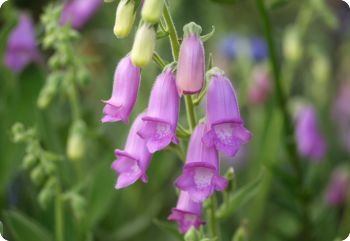 Digitalis thapsi 'Spanish Peaks' is a beautiful foxglove species that blooms in early summer with purplish-pink flowers that are held gracefully away from the stems. The flowers, stems and leaves are covered with tiny hairs, giving it a soft appearance. Spanish Peaks foxglove is relatively short, so it's best planted near the front of the border or at the edge of a woodland path. Shade tolerant. Also known as Fingerhut Foxglove. Deer resistant. Short-lived perennial. Hardy in zones 4-9. Start foxglove seeds indoors 8 weeks before the last frost date. Sow on the surface. Full sun to part shade.